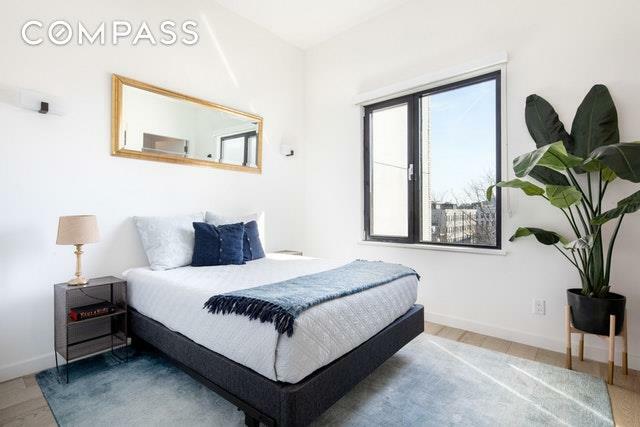 Welcome to Penthouse C at 160 West Street, an incredibly bright and loft-inspired condominium located on the idyllic corner of Huron and West Streets in Greenpoint. Defining features of this beautifully designed, 1,103 square foot loft include: 11.5 foot ceilings, dramatic floor to ceiling windows in the great room, a large balcony and private cabana, epic eastern and western light and a thoughtful floor plan featuring two winged bedrooms, two full bathrooms and a ton of storage. Natural light floods into Penthouse C as soon as you enter the home. A formal entryway greets you upon arrival with ample space for a bench or consul and room to display large pieces of art. The dramatic ceiling heights and open floor plan are a necessary departure from most of the neighborhood's cookie cutter construction. 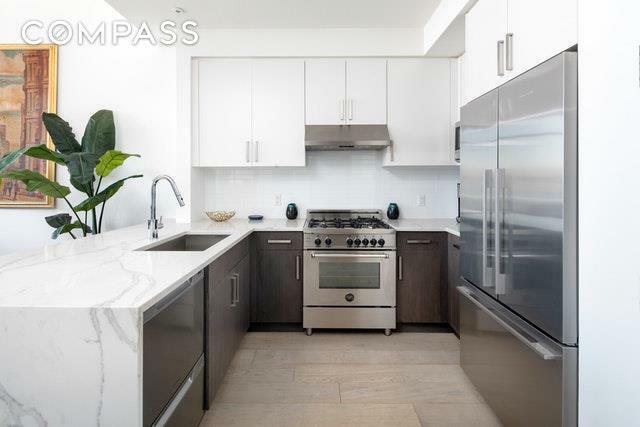 Highlights of the living room include floor to ceiling windows facing west, a large private balcony, 6 inch wide oak floors, a large and U-shaped open kitchen with state-of-the-art appliances and a palette of bright + beautiful materials and finishes. Past the kitchen, a setback master suite faces east and features a striking master bathroom with a large walk-in-shower, radiant-heated floors and a custom vanity with double sinks and thoughtful storage. The oversized and private second bedroom has a picture window facing west and a large double closet. Additional features of Penthouse C include in unit washer/dryer and a massive coat closet located in the entryway. The Gibraltar is a 6-story, 14-unit boutique condominium with a distinctive Equitone Grey facade. 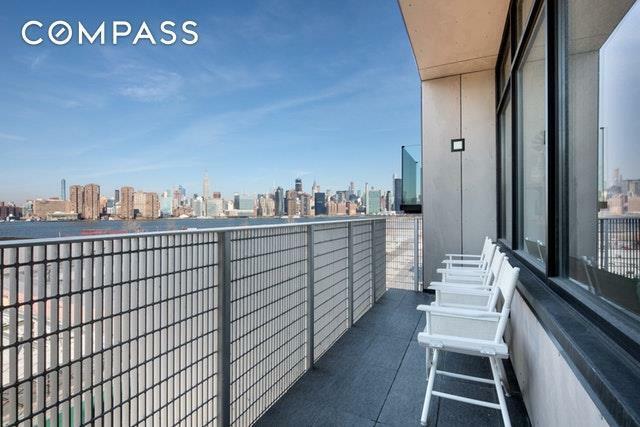 In addition to Penthouse Cs private balcony and private cabana, there is also a common roof deck, on-site parking, a virtual doorman and package room, bike storage and private cage storage for each apartment. The best of North Brooklyn is right outside your front door in this dynamic and magical pocket of Greenpoints burgeoning waterfront. Take advantage of nearby destinations and amenities including the shops + restaurants on Franklin Street, the G train, the East River Ferry and all of the brand new retail, residential and commercial development making its way into this immediate location. Tenant currently in place until November 2019. 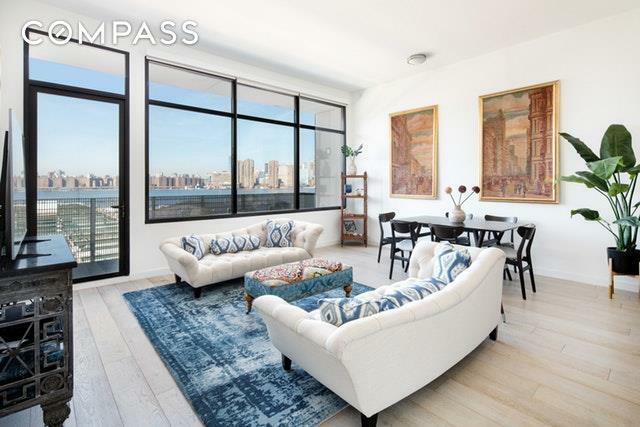 Listing courtesy of Michael Rubin of Compass.